In a relatively short amount of time, Kevin Feige has gone from being the assistant to a prolific producer to running one of the biggest and most respected studios in Hollywood. While attending the University of Southern California, he interned for producer Lauren Shuler Donner, becoming her assistant upon graduation. While the first X-Men was in production, Lauren Shuler Donner made him a co-producer, due to his incredible wealth of Marvel knowledge. Seven years later, he was named President of Marvel Studios, paving the way for the immensely successful Marvel Cinematic Universe. The MCU gets a new addition this week in Guardians of the Galaxy, a cosmic romp that expands Marvel's reach to the outer edges of the universe. 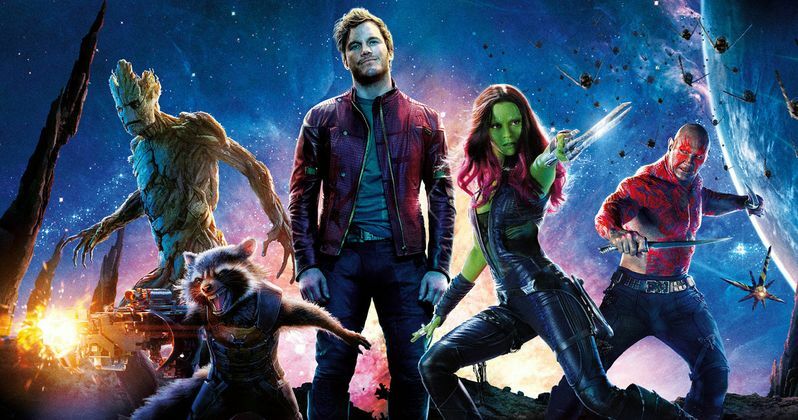 While fans have been taken to other worlds such as Asgard in Thor and Thor: The Dark World, Guardians of the Galaxy takes fans on a truly cosmic, futuristic adventure with a unique group of heroes and villains, which is complemented, oddly enough, by a gloriously retro soundtrack. I recently had the chance to speak with Kevin Feige about Guardians of the Galaxy, which hits theaters August 1, where he discussed the original script by Nicole Perlman, bringing on writer-director James Gunn, Marvel's release strategy and their approach to secrecy. Take a look at what he had to say below. Can you talk a bit about Nicole Perlman's first script that came out of your writer's program? Has a script from that program ever developed into a movie like this? Kevin Feige: Well, writers have come out of there. For instance, Christopher Yost was in that program, who got credit on Thor: The Dark World and is working now on the next Thor film. So, there has been talent that came from that. Guardians, though, you're right, was the first script that was put into development as sort of a, 'Hey, this might be cool one day,' that has come to fruition. Can you talk about the elements of that draft that did make it through? Kevin Feige: Quite a bit. I mean, she's got story credit on the movie, deservedly so. This entire roster of characters was a part of the script. There are some things that are no longer a part of it, but I would certainly say that the movie, start to finish, and the screenplay, start to finish, is 100% James Gunn. But, the structure and bones of it, and what really made us - and James, because that was the draft that he read - go, there's something here, this is exciting. There are some other characters that she had in early drafts that we then took out, as it formulated closer to this, but that was very much what lead to this final product. Is that an ongoing thing at Marvel, the writer's program? Kevin Feige: That always sort of had a specific time limit on it, as an experiment. It was an experiment that worked, but maybe we'll start it up again some day. I also read that, when James (Gunn) came on board, Joss (Whedon) wanted more James Gunn in the script. Kevin Feige: Yeah, that was one of his few notes. Does a lot of the humor we see in this movie, is it part of those notes? Kevin Feige: A lot of that was already there, but I think that was kind of an encouragement. We read an early draft and commented on a scene that's in the movie, where the five characters are just sitting around trying to come up with a plan. "I've got part of a plan." "How much of a plan do you have?" It's about a seven or an eight-minute scene of characters, essentially, just sitting in a circle, talking. We said, 'James, this is great! That scene!' He said, 'I'm not sure if you'd like it. It's just people talking.' We said, 'We love it! Make the movie more like that!' And, as he tells the story, he found that very encouraging, to keep embracing what his instincts were, for what would work. I loved the look of this film. It's just amazing. A lot of movies today you can tell exactly which parts are green screened, but this one, it feels like you're there, in an actual environment. I was particularly impressed with the Kyln set, and I read that was your largest build. Kevin Feige: It was. It was almost all practical, except when the camera looks up, at all of the cells going upward. Everything else is actually there. It was built at Longcross in England by our production designer Charles Wood, who we worked with for the first time on Thor: The Dark World. We were so impressed with him we brought him in for Guardians, and we were so impressed by that, he's finishing up Avengers: Age of Ultron. I can't imagine you were even thinking about using green screen for that set. Kevin Feige: So much of the movie takes place there, so you want to have that actual environment. I have to imagine that the soundtrack is going to sell like hotcakes. Kevin Feige: I hope so! It's a lot of fun, and it takes me back to the very first soundtrack I ever bought. I think I had John Williams' Star Wars, because I think my parents had that on a record, but the first one I bought was the Back to The Future soundtrack, half because I love (Alan) Silvestri's theme, of course, but half because I love those 50s songs in the movie. I often think about that with this one, that you can go and revisit scenes from the movie by listening to, not only Tyler Bates' awesome, awesome score, but the mixtape. On the mixtape, were those songs all written in the script? Or was it a process of figuring those out? Kevin Feige: They were written in the script. In the very first draft, the original script, and when I have my red pen and read scripts the way I do, I circled each song, and I thought, 'Maybe this will work, but we'll probably have to go through 10, 20, 30 different songs for every cue to land on one,' because that's usually our experience, you have to turn a lot of things over. Every single song is exactly the same that James laid out in his first draft, which I never would have predicted. They're great. They're brilliant. That's great. I hope you guys actually start selling mixtapes too. Kevin Feige: We thought about that. The cover of the album is the mixtape. I also read that you had trouble finding the actual Walkman that Peter uses. That surprised me. It is a relic from a former era, I guess. Kevin Feige: They really are hard to find, and they're getting even harder to find. I did a search on eBay, not that long ago, a couple of months ago, I think, to see, maybe we'll buy some as a crew gift or something. I found like one, of that exact same kind. The headset in particular, I think, is hard to find, with that foam. Did you ever collect Star Wars toys growing up? Kevin Feige: You remember the Dagobah playset that had quicksand with that little foam? That foam did not last very long. My guess is that's what happened to those headsets. That's my time. Thank you so much. Congratulations on this again. Kevin Feige: Thank you. Glad you liked it. Stay tuned for more Guardians of the Galaxy interviews later this week, as we get closer and closer to the August 1 release date.